What a bad loss. Being beaten by an innings and 90 runs – that too at home – It’s gotta hurt. Not just the fans, but it must hurt the team members too. India needed to bat out of their skins to save the game, but they didn’t. Sehwag started with a couple of sixes, but left in a hurry. When Dravid got out, the writing was already in the wall (pardon the pun). Jaffer went soon after and then it was left to Ganguly and Laxman to stop the slide. They started putting on a partnership and as it happens so frequently, Laxman got out against the run of play with his score in the thirties. Ganguly and Dhoni tried to prolong the inevitable, but a poor umpiring decision put an end to Ganguly’s innings. Dhoni scored a fighting fifty and Pathan chipped in with some runs, but India was well and truly beaten. In the series so far, Kumble hasn’t been his usual self and the fast bowlers have been ineffective. Ishant Sharma’s inclusion should boost the bowling. But it was the batting that let India down. The decision on whether to go with the extra bowler as they did in this game or pick Yuvraj as an additional batsman is going to be tough one. Will have to wait and see how this one unfolds. But it is time for India to forget this match, regroup and try to level the series in Kanpur. India may be ranked No. 2 in the World, but at the moment they don’t look anything like the second best team – not by a long shot. Whenever India plays cricket and there is no TV coverage, I feel disappointed on having missed out. After India’s capitulation under one session yesterday and the beating they have taken on the field since, I am actually a bit glad for once that I am not watching the game. It is highly unlikely that after conceding 418 runs lead (and counting) that India can save this match. I am sure a lot of Indians are praying for some kind of miracle. Well, we definitely need some divine intervention to save India from an innings defeat. There are still 3 full days left in the match and I can’t see India playing out a draw. Watching the South African score, it is pretty clear that there were no demons on the pitch. If there were any demons, it must have been on the minds of the Indian players – how else can you explain losing all your wickets in under 20 overs in a test match? South Africa are sitting pretty at the moment. Their top order has had plenty of batting practice and have scored runs by the truck loads. In their 3 innings so far they have aggregated close to 1300 runs – and we haven’t been able to take 30 wickets in 3 innings so far. Except for Prince, every batsmen in their team has scored runs. Of their bowlers, Dale Steyn has been outstanding taking 9 wickets in the two innings he has bowled. India on the other hand are a far cry from the team that beat Australia in Perth. The bowling has looked ordinary and the fielding – well, the less said the better. But the most worrying thing is the batting, which is supposed to be its strength. Agreed India scored over 600 runs in the 1st test – but more than half of that came from the bat of Sehwag. You take his score out, and India would have been in big trouble in Chennai too. There have been some notable failures and we can’t afford any of them in the second innings. Ganguly has to lift his game. He hasn’t scored too many runs since the Sydney test. Dhoni has done well in the shorter form of the game, but is averaging just 17 runs in his last 10 Test innings. He has to lift his game too. Laxman has been amongst the runs, but he needs to learn how to control the strike when playing with the tail. Sadly, It is probably too late in his career to learn to do that. In Tendulkar’s absence, he was rightfully moved to No.4, but lasted just 7 balls. Hopefully, he can do a lot better in the second innings. We need Sehwag and Jaffer to get a good opening partnership and Dravid to hold the middle order together. I am not under any false pretence that India will save this game – all I want them to do is to put up a good fight and play for some pride. What are some of the main traits of an opening batsman? They have to be patient, disciplined and maybe even courageous. Most importantly they should absolutely not take any risks. This is exactly what makes them dull and boring as well. There have been exceptions along the way – Krish Srikkanth was one. He was dashing and people loved to watch him, but he was also inconsistent and unreliable. Matty Hayden is another, and there are probably a few more – but none, in my opinion, come close to Virender Sehwag. Sehwag – What can I say about him? The selectors should have kept faith with him during his slump and persisted with him. Actually, if you look back at his records, his test form has not been that bad – sadly, his ODI form was used as a measure and he was sacked from the Indian team after just one bad series in South Africa. He was kept away from the team that toured Bangladesh and England and when he was not even short listed for the Australian tour, his test career seemed completely stalled. As luck would have it, Gambhir was injured and Sehwag was picked in his place to tour Australia as the third choice opener and he even ended up playing the last two test matches. You know what they say – “Form is temporary, class is permanent”. Sehwag did showcase his class under pressure in the last test against Australia with a fine 151, but with today’s knock of 309*, you can safely say that Sehwag is well and truly back. No other Indian has scored a triple century – but Sehwag now has two. There are probably another dozen or so records he broke today, but the important thing is that he managed to keep India in the game and put the team in a commanding position. Wasim Jaffer (73) gave him company and was involved in a solid start of 200+ runs. Rahul Dravid (65*) gave him good company too in the partnership of 255 runs, but the day belonged to just one player – Sehwag. At the end of day 2, the match looked like it was destined for a slow death and if India continue to prepare such pitches, Test cricket itself will die a slow death – actually make that a fast death! Virender Sehwag however managed to infuse life into the dull game and India are now in a position where they can even think about winning the game – it all depends on how much lead India take and if the pitch starts crumbling like a cookie when South Africa bat. All three sessions of the day belonged to India and the SBS scorecard reads 4-4. The biggest threat to Sehwag today was the zapping heat and humidity and it was a relief to see him make it to the end of the day. The whole of India would be hoping that Sehwag bats at least another session tomorrow. If he does, he may end up breaking Lara’s record for highest individual score and more importantly will put India in a very strong position to take the match. A match that was destined for a slow death looks headed for a painful death at the end of day-2 of the Chennai Test match between India and RSA. At the end of day-2 on a flat, docile, graveyard of a pitch the South Africans had made 540 all out. In reply, India made a brisk 82 for no loss off 21 overs. It was a hot, energy-sapping day that saw a continuation of some ill-directed bowling, bad fielding, ill-tempered admonishment between some of the Indian players, some careful batting, a solid (if not spectacular) batting display by Hashim Amla, a solid (if not spectacular) bowling display by Harbhajan Singh and a confident response from Wasim Jaffer and Virender Sehwag. All of this on a pitch that looked less interesting and more dead than it was on day-1 — if that was at all possible! Virender Sehwag admitted that the Indian fielding was somewhat shoddy. There were times when Kumble remonstrated openly with Laxman; Harbhajan with R. P. Singh; Harbhajan with Sree Santh; Dravid with Sreesanth… It seemed that it was open season on venting frustrations against anyone — and the younger players seemed to cop it more than the seniors! The India bowlers toiled all day. They had to be extremely patient. It did not help that the umpires seemed to work against them too. I felt sorry for Sree Santh when what looked like a plumb LBW against Mark Boucher wasn’t given by New Zealand umpire Tony Hill. “What was he thinking? Had the heat fried his brains?” were questions that popped to my mind! Replays showed the thinnest of inside edges! Similar questions with some choice expletives popped out when Asad Rauf did not spot a glove-deflection off Paul Harris to Rahul Dravid at slips off the bowling of Harbhajan Singh. The fact that Rauf did not spot the deflection or the accompanying dead give-away (batsman’s head snapping backwards to see if the catch was completed) would have left the already enervated players even more deflated and exhausted. The South Africans batted extremely well though and battled the hot conditions as well as steady bowling from Kumble and Harbhajan Singh. Hashim Amla, in particular, looked solid as a rock. Sree Santh bowled a good morning spell but fell away after that. R. P. Singh continued to bowl like a millionaire. In reply, thanks to Sehwag’s 61-ball 50 and Jaffer’s patient 21 off 65 balls, India reached 82-0. There is still a huge total to overhaul though and it may be that India need to bat on and on and on for getting even close to manufacturing a result in this game. Either that or the Indian batsmen have to throw their wickets away in a stunning array of rash strokes. I can’t really see the bowlers doing too much on this pitch! I give the first two sessions of the day to South Africa and the last one to India and so the SBS at the end of day-2 reads: India, 1 : South Africa, 4. The last test series between the two countries was a very close one that India eventually lost 1-2, but this time India have the home advantage and SA have to reckon with a team high on confidence. India also have a good mix of experience and youth to pull it off. So, should we start speculating what the Indian team make up would be? I think Sehwag should be an automatic choice and we shouldn’t let his ODI form affect his test chances. Jaffer and Karthik both failed in Australia, but I would imagine that Jaffer being a regular opener would get the nod ahead of Karthik. Chopra and Gambhir would probably also be in the selectors radar, while Dravid and Pathan have an outside chance of being considered as an opener. Kumble is an automatic selection and if you are playing in India, Harbhajan Singh is another automatic selection for the second spinner spot. Zaheer Khan is still injured and the other two bowling spots would probably end up going to Ishant Sharma and RP Singh. If the track does take a lot of spin, then including a 3rd spinner (Piyush Chawla) may not be a bad idea, with Pathan opening the batting and also sharing the new ball with Ishant Sharma. That makes up the 14. Not much different from the team that toured Australia, but why should it be? At the end of day-2 of this fascinating Test match in this gripping series between Australia and India, both teams find themselves in unfamiliar territory! It is not often that Australia is so far behind in a Test match with 3 days to go in a Test match. Conversely, it is not often that India is so far ahead in a Test match with 3 days to go! It is a wonderful platform for India and needs a few people to stand up and be counted. From here on in, it is a question of whether India believes it can win. The moment India show nerves and self-doubt, in my view, this powerful Australian team still has the ability to climb all over it. So it is going to be a test of nerves, self-belief as well as ability from here. There is little doubt in my mind, however, that India is on top in this game after 2 days have been completed. Whichever course this match takes though, there is no doubt in my mind that after the sorry mess and the debacle of Sydney, India has re-grouped well and come out the stronger for it. India is playing with purpose, direction and energy. They are pumped up and want to win. A local news channel in India claimed that the Indians had a 45-minute closed-door session with Gary Kirsten after the end of the 1st days’ play. Much of it concentrated on the team playing with fire and with pride. On the other hand, Australia has looked somewhat listless and de-energised right through this game. On a day when 297 runs fell for 15 wickets, India came out on top. The day started with Australia cleaning up the India tail. Starting at 297 for 6, India started sensibly with M. S. Dhoni and Irfan Pathan batting sensibly. Then close to the finish of the hour, it ran away from India and they were down in a heap; all out 330. One thought that that was about 120 runs short! They may have got there had Dravid and V. V. S. Laxman not given it away as they did! Australia came out with purpose in their batting. They were, after all, batting in their home den! Most of their batsmen were used to the sting and bounce in the wicket. For all them, hitting on the up and through the line in Perth was as easy as spreading Vegemite on their daily toast! What they did not account for was accurate, relentless and steady top-class seam bowling. One wished one could bottle the caliber of disciplined bowling that was on display by the Indian seam-bowlers! At the end of the days’ play R. P. Singh said that the bowlers had a meeting prior to the game in which each of them was assigned a task. R. P. Singh’s task was to use the bouncer frequently! Each bowler had “areas to bowl to” agreed to. Now, to plan these things is one thing. To actually go out there and execute these plans is quite something else. The Indian bowlers did that and came out the victors today. Let us not forget also that this is not actually India’s first line pace attack! Zaheer Khan, Sree Santh and Munaf Patel are back in India, nursing injuries! Given the display of the 3 seam bowlers today and with Pankaj Singh, V. R. V. Singh, Ranadeb Bose and Praveen Kumar waiting in the wings, one might say that the pace bowling stocks aren’t exactly looking bad at the moment! One point that was hammered home forcibly today was Irfan Pathan’s resurgence. I’d like to see Pathan as part of the Indian team mix for a long time to come. He bowled brilliantly. Agreed, he bowled better to left-hand bats than he did to right handed bats. However, his pace was consistently in the high 130s and he had his swing going too; and this was late seing, by the way! His batting abilities at #8 (in this match) means that India can often go with 4 other bowlers in the team; this is always a plus especially in India where 2 spinners have to play! Given that Australia wrapped up India’s innings close with just 33 added to the India overnight score of 297-6, one may have been tempted to call the 1st session as Australia’s. However, with some clever seam bowling, India managed to get two early wickets — admittedly one dodgy LBW decision when the ball appeared to be heading down leg-side — I’d be tempted to call this an even session. The SBS Score read Australia, 2.0 :: India 2.0 at this stage. The second session belonged to India though. Australia were on the ropes at 61-5. Andrew Symonds and Adam Gilchrist came up with a breathtaking display of counter-attacking batting. This was counter-punching of the highest caliber that produced a run-a-ball century partnership. However, the Indian bowlers stuck to their task, best displayed by R. P. Singh, in a terrific show of level-headedness in the post-tea session. He was spanked for 3 consecutive 4s by Gilchrist. However, he produced a lifter from just short of a good length. It caught Gilchrist unawares and the resulting edge was poached by Dhoni. Despite the precarious 60-5 situation that Australia found herself in, the Symonds-Gilchrist fireworks show took Australia to a reasonably comfortable position of 148-5 at Tea. These runs had come off just 31 overs! I just couldn’t believe that this team was under the pump! Visions of Mumbai 2001 flashed in front of me where, from a position of 99-5 Gilchrist and Hayden rescued the team with a gritty and purposeful fight-back. In this session, India missed a catch off Symonds — Tendulkar dropped the edge at 1st slip. Had that catch been taken it would have been an even session. The SBS Score read Australia, 2.5 :: India, 2.5 at this stage. The 3rd session belonged totally to India. First India got Australia out for 212. In their response, India lost only 1 wicket — that of the hapless Wasim Jaffer who is having a nightmare series from hell! Along the way, Anil Kumble got his 600th wicket. What an incredible servant of Indian cricket this amazing cricketer has been! He could come into his own in this Perth wicket which, amazingly, is taking some spin too! Virender Sehwag was, well, Virender Sehwag. He played and missed several times. But still he scored at a rate that only Sehwag can. The Australians are wary of Sehwag. They want to get him out and see the back of him. In that itself India wins part of the battle. He is still there and that will be a big plus for the tourists as they come out to bat tomorrow. The fact that Irfan Pathan is there at the crease as a night-watchman is also good for India. He can stick around and make life miserable for the Australians who will need to dislodge him in order to have a crack at the Big 4 to follow: Dravid, Tendulkar, Ganguly, Laxman! The SBS Score reads Australia, 2.5 :: India, 3.5 at this stage. India are ahead. It is an unusual position for this team. But one that India needs to capitalise on. Anil Kumble, in a post-match interview, said that the strategy would be one of playing time; the runs will come. I have some sympathy with this strategy. Firstly, we have just finished day-2. There is a lot of time left in this game! India should focus on playing out each session and slowly, batting Australia out of this Test match! India is 170 runs ahead at this stage. At the end of tomorrow, if India bats all three sessions, the team could well be 450 runs ahead! This will require some patience and a lot of determination. In post-match interviews Adam Gilchrist did admit — as most people will — that India is in the drivers’ seat in this match. However, he did say that the Australian team relished the challenge and that they would dig deep to come after the Indians. If Australia get India out cheaply, they could win from here too! But it would require a special effort from them and some clumsy batting from the Indians. The Harbhajan Singh episode reminds me of an old Bollywood dialogue: “Moti choor ke Ladoo; khao to pashtao, na khao tho pashtao“. [“If I keep a plate of Ladoos (sweets) in front of you, you will undoubtedly experience regret, either by ignoring them or by gobbling a bunch“]. Yuvraj Singh, Virender Sehwag, Dinesh Karthik, Wasim Jaffer, Sree Santh (thankfully not in this team at present), led by the firebrand Harbhajan singh, more aptly teens than Twentys’ champions, are capable of providing the Las Vegas experience, without the associated cost at the roulette. No one, including themselves, can predict what they might offer on a given day. Their contributions can see-saw between the magical and the pedestrian with a stochastic pattern that can drive a mathematician crazy, let alone a poor cricket fan. Added to that is the new brand of aggression that is very reflective of the Bollywood movie “Rang De Basanti”, with the foreigner’s role to be soon conferred upon the latest sensation “Padukone”. The IPod generation, reflecting the optimism and confidence of a booming south east Asia, has not had the time to realize its identity. The heady success in the Twenty20 World Championship has for this class, erased the distinction between the popular and the classical. In pursuit of becoming the Ricky Martins, they have consciously chosen to ignore the needs of a Pavarotti. The solitary reaper in this pack is the one man that the BCCI rightfully picked as captaincy material, Mahendra Singh Dhoni. Coming from Jharkand, neighbour to arguably one of the most backward and rowdy states in India, he has been, in a sense the magical Laloo Prasad Yadav for cricket. His mannerism and methods are simple, fair and effective. He has this innate calmness that transcends his game beautifully from the aggression needed in the shorter form, to the grit and patience needed in the longer version. 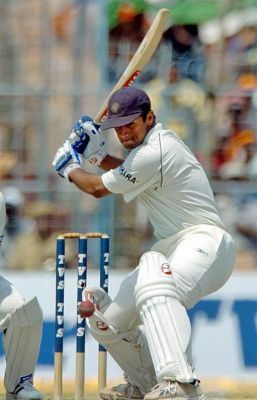 For, I dread the day, when the likes of Rahul Dravid, Sourav Ganguly, V. V. S. Laxman, Anil Kumble and Sachin Tendulkar retire from Test cricket. Let alone their cricketing skills, in their absence, there is all round concern. Along the same lines, I have an intuitive bad feeling that the Indian team is soon to confront the possibility of a 4-0 drubbing at the hands of the Australians. The Indian team is not in the right frame of mind presently, after all the frustrations, emotions and scrutiny they have had to experience in the last Test at Sydney. In addition, what confronts them is a pace packed all out attack by the aussies at Perth, which has historically been our most challenging venue in Australia. Adding to these is our internal confusion with respect to team selection. A very realistic assessment of Team India’s capabilities and Australia’s, rings a very uncomfortable tone. If the Perth Test goes the Australian way, the probability of which is high, there will be an increased vigour among them towards a whitewash. I am convinced that this will play into the minds of our players and affect their approach even more negatively. Which begs the question – What do we do if we get beaten by 4-0? Indian cricket faced a similar question, though a bit more shockingly, 12 months back in the West Indies. India has made a hasty exit from the World Cup. Have we made any progress or are we in for more Deja Vu in the coming months?